Welcome to the first SCUBA News of 2014. 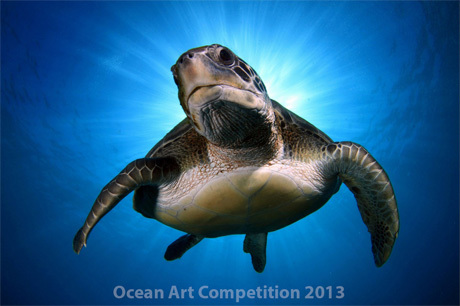 We've some extraordinary images in this issue - just a few of the prize-winning entries to the Ocean Art underwater photography competition. Congratulations to all the winners. Plus, see what divers have been reading over the past year. We are pleased to announce the top ten bestselling books and dvds of 2013. Dive Atlas of the World regains its number one spot, after dropping to number five on the list last year. Diving Southeast Asia is a notable re-entry - not seen in the top ten since its publication date of 2009. There are also several completely new entries. Almost all the books (and the single DVD featured) are either highlights of the best diving around the world, or are sealife guides. The notable exception is North Sea Divers - A Requiem. 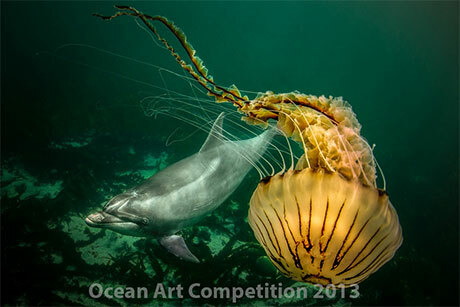 Over $80,000 of prizes has been awarded to 64 underwater photographers, in the annual Ocean Art competition. Organised by the Underwater Photography Guide, judges included the highly-respected Tony Wu, Martin Edge, Marty Snyderman and Todd Winner. 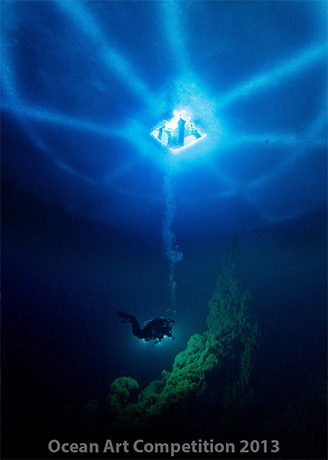 The best of show was a stunning wide-angle photo shot under the ice by Victor Lyagushkin in Russia. The outstanding image in the wide-angle category was of a freediver swimming into a massive bait ball in Tenerife, by Francis Perez. 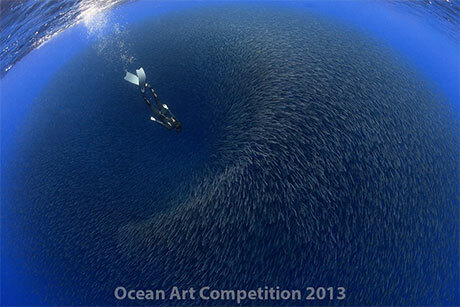 Dolphins, shearwaters and seagulls were all attacking this enormous shoal of fish, making it change shape. Another winner from Tenerife - Montse Grillo's portrait of a turtle. The green turtle was coming fron the surface with the sun behind it. This was taken at night, five miles off the coast of the Big Island of Hawaii. The photographer says "The tiny octopus stopped in my lights, intently studying me as I studied it, and then began to expressively posture and react to my every move. The cephalopod would move into position then freeze for a few seconds before adjusting its exaggeratedly long arms again. It went through probably a dozen different poses before moving on and into far deeper water than my comparably feeble physiology would allow." The contest was open to novices and professionals alike. 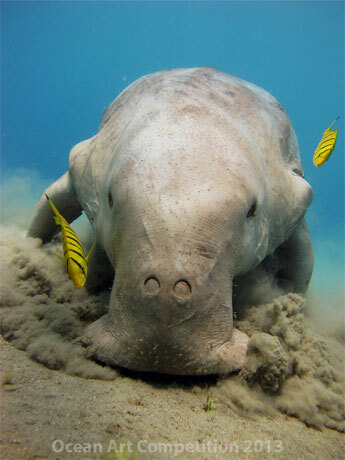 This photo of a Dugong shot in the Red Sea won the novice compact category. Shot in Abu Dabbab, Marsa Alam, by Laura Dinraths. Thousands of entries were viewed by the judges before the final set of images were selected and deemed some of the best underwater photos in the world. Karbus captured this shot whilst free diving in County Clare on the West Coast of Ireland. It was summertime and plankton was booming attracting the jellyfish. He was admiring this majestic Compass Jellyfish when a curious Bottlenose dolphin passed by. He managed to get both animals beautifully composed together. The judges admitted that their job was difficult due to the high quality of so many images. Contest judge Martin Edge said, "Without doubt, the most demanding underwater photo competition that I have ever been involved in. So many excellent, diverse and wide-ranging images to choose from." 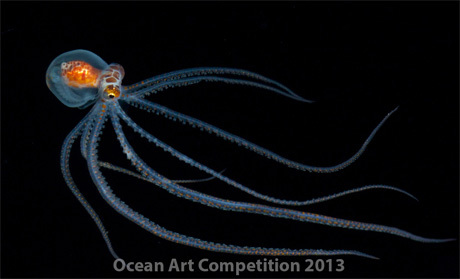 You can see all the winning photos on the Underwater Photography Guide site at http://www.uwphotographyguide.com/2013-ocean-art-contest-winners. Large, shallow-water species are at most risk. The Indo-Pacific, particularly the Gulf of Thailand, and the Mediterranean Sea are the two hotspots where the depletion of sharks and rays is most dramatic. The Red Sea is also home to a relatively high number of threatened sharks and rays. Opponents to the West Australian government's shark killing program have responded angrily to the first slaughter in the state's waters. German customs officers have confiscated whale meat snacks being sold by a Norwegian stall at Berlin's Green Week. The stallholders could face prosecution and up to a 5 year jail term. A prehistoric shark species is the earliest animal known to migrate, over 300 million years ago. The sharks lived in rivers but swam down to the sea to breed and care for their young. Researchers from the University of Nebraska-Lincoln, while using a camera-equipped robot to survey the area under Antarctica's Ross Ice Shelf, unexpectedly discovered a new species of small sea anemones that were burrowed into the ice, their tentacles protruding into frigid water like flowers from a ceiling. River dolphins are among the world's rarest creatures. There are only four known species, and three of them are on the Red List, meaning they are critically endangered. Now scientists in Brazil have discovered a new type of river dolphin.